Send a Cuddly Bear to a Hospitalized Child this Valentine's Day. To include a Valentine's Day card, please write a special message in the note section once you click the Donate button. Will You Be A Sick Kid's Valentine? Instead of celebrating with a party at school, many of our enCourage kids spend Valentine's day isolated, in a scary setting away from their friends, and may not get a special Valentine. This Valentine's Day we need your help spreading love to hospitalized children. A small gift of $25 places a cuddly Bear into the arms of a sick kid, providing comfort when they need it most. Take your gift a step further. Write a personal message that will be printed out on a card and included with the enCourage Kids Bear(s). Just a few words can mean the world. 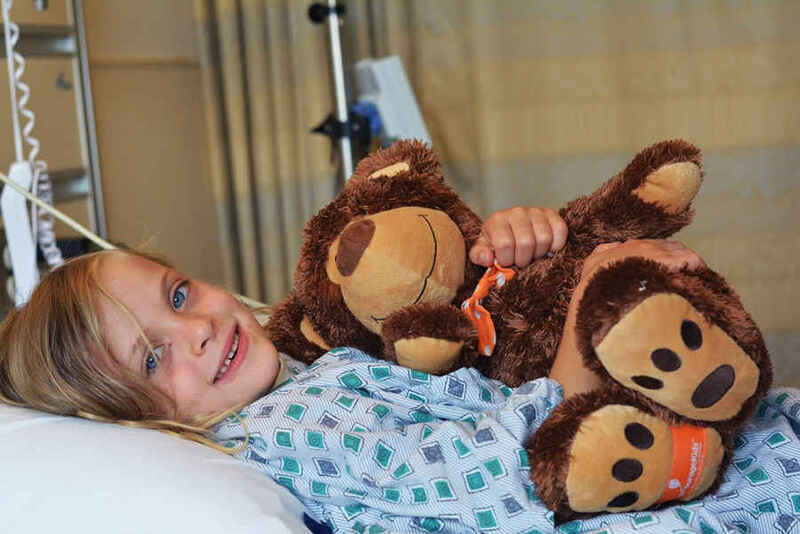 Pediatric patients see a friend in the enCourage Kids Bear's smiling face, and Child life specialists, nurses, and doctors use the Bear for 'medical play' — helping young patients know what to expect during a hospital visit and feel in control of their experience. This Valentine's Day, share your heart and help brighten a sick kid's day. Show them how much people like YOU care by sending them something extra special. P.S. Please keep it positive and focused on Valentine's Day. For Example: Happy Valentine's Day! Sending hugs and smiles to you today. *Each bear is individually wrapped, meeting hospital protocols for health standards. Hoping to add some happiness on Valentine's Day to a child fighting with everything they have. It's the least I can do. Happy Valentine's Day! Hug this Bear & realize that she loves you, as we do, too. Get better Soon. This Bears' for you, she's tried n true, when you're blue, hug her to you. She'll be your boo, and love you too. Happy Valentine's day! Happy Valentine's Day! Sending hugs and smiles to you today.